Eat Dark Chocolate Berry Yogurt Parfaits for breakfast for an indulgent start to the day. 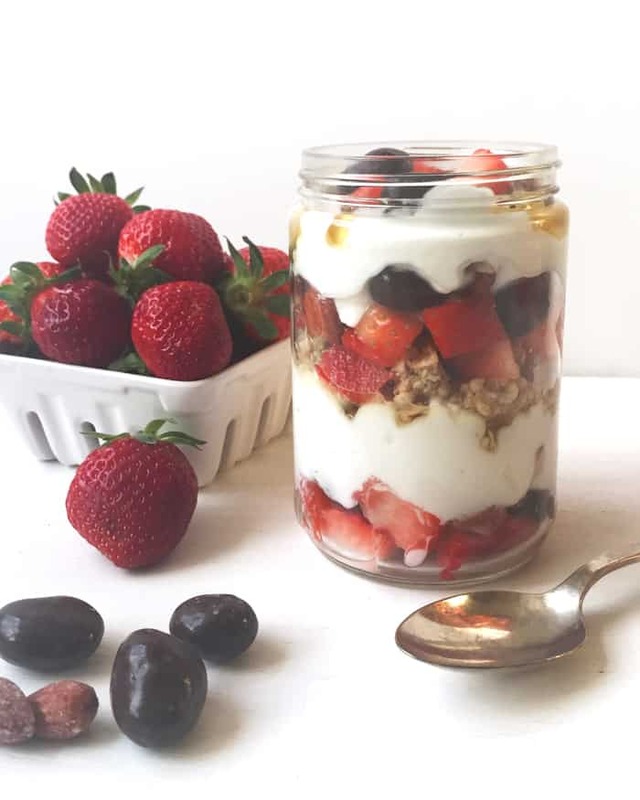 With DOVE® Chocolate Fruit & Nut added into the mix, these parfaits make mornings dreamy. When you’re on the go a lot, it’s hard to make time for breakfast — sometimes even lunch! 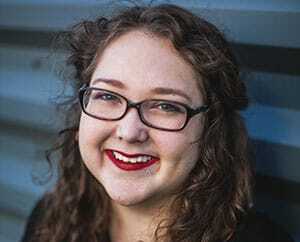 As a freelancer who is not a morning person, I am always slammed with deadlines and running off to make recipes and attend events. 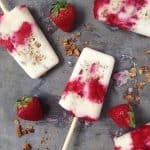 Quick meals and easy snacks are my saving grace. Most quick meals out there aren’t all that good for you, though. One of my goals for 2016 is to eat better, so I try to start off my days with a nutritious boost. And to do that, this night owl tries to plan ahead as much as possible. 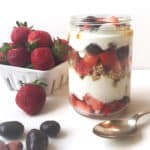 I have started making my own granola on the weekends, and the night before I need a quick breakfast, I layer the granola with yogurt, honey and fresh fruit. Homemade, make-ahead yogurt parfaits are great because you can control exactly what goes in them, and they’re ready to eat the next morning. And voilà! Dark Chocolate Berry Yogurt Parfaits. 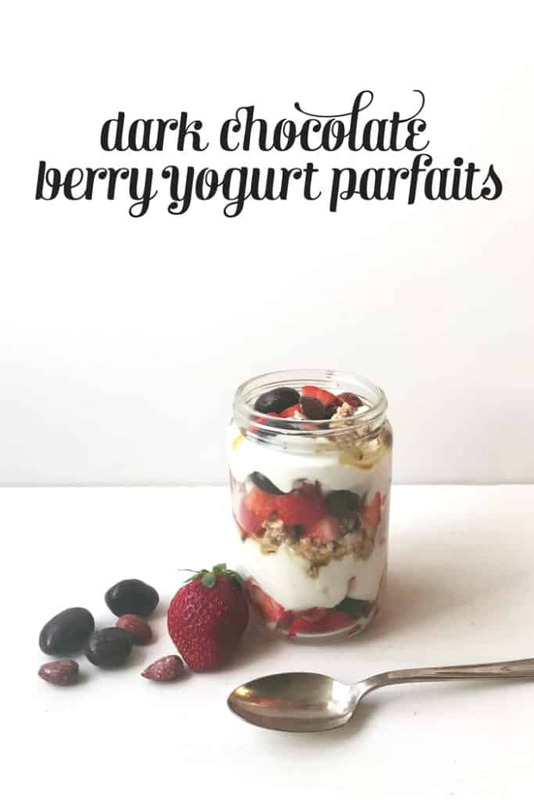 Click through to read the Dark Chocolate Berry Yogurt Parfaits recipe! I found the DOVE® Chocolate Fruit & Nut products at my local Walmart store, in a special display at the front of the store. I tried several of the flavors — the DOVE® Dark Chocolate Blueberry & Vanilla Cashew was so tasty! The DOVE® Dark Chocolate Cherries took me right back to ones I tried in Seattle last year! 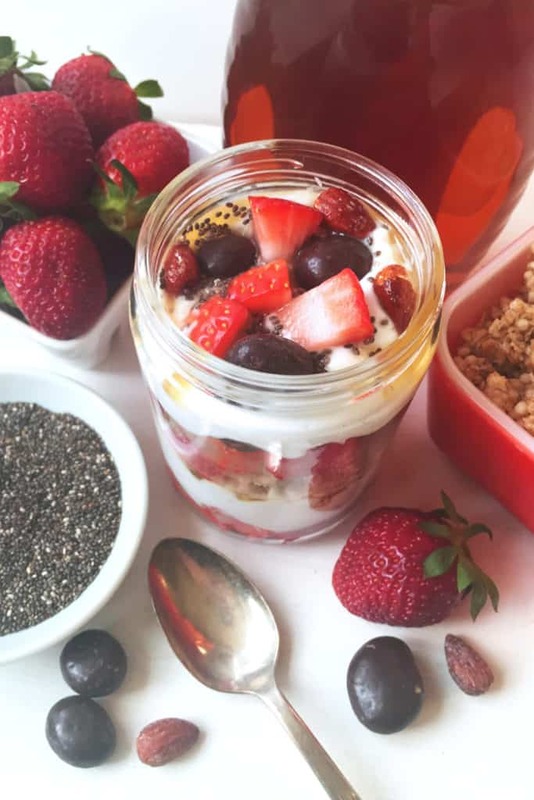 Eat Dark Chocolate Berry Yogurt Parfaits for breakfast for an indulgent start to the day. With DOVE® Chocolate Fruit & Nut added into the mix, these parfaits are even more dreamy. 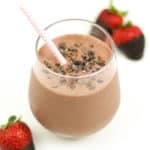 Layer a third of the strawberries and 3 to 4 pieces DOVE® Chocolate Fruit & Nut in the bottom of a jar. Top with half of the Greek yogurt and 1 tablespoon honey. 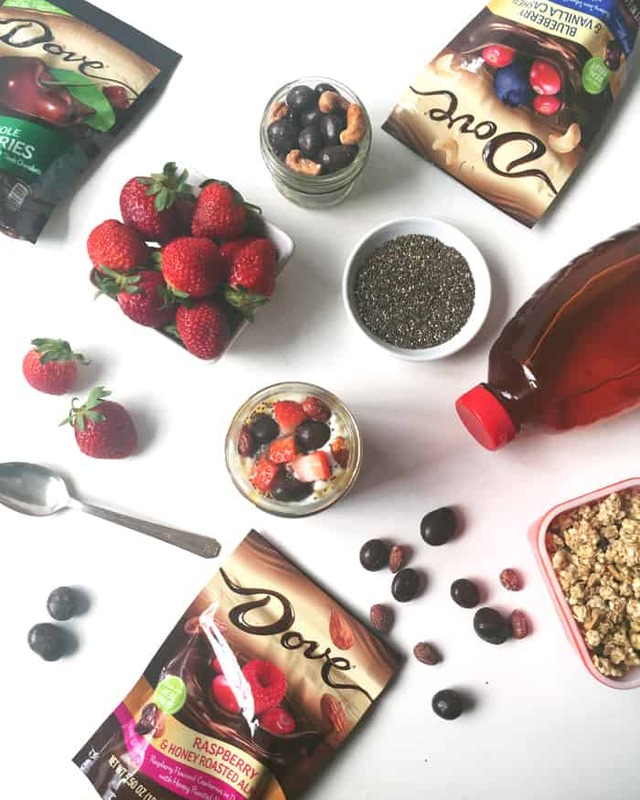 Layer with 1/4 cup granola, another third of the strawberries and 3 to 4 pieces DOVE® Chocolate Fruit & Nut. Add the rest of the Greek yogurt, honey, granola, fruit and 3 to 4 pieces DOVE® Chocolate Fruit & Nut. Sprinkle chia seeds over top. Store in an airtight container. Refrigerate up to 12 hours. 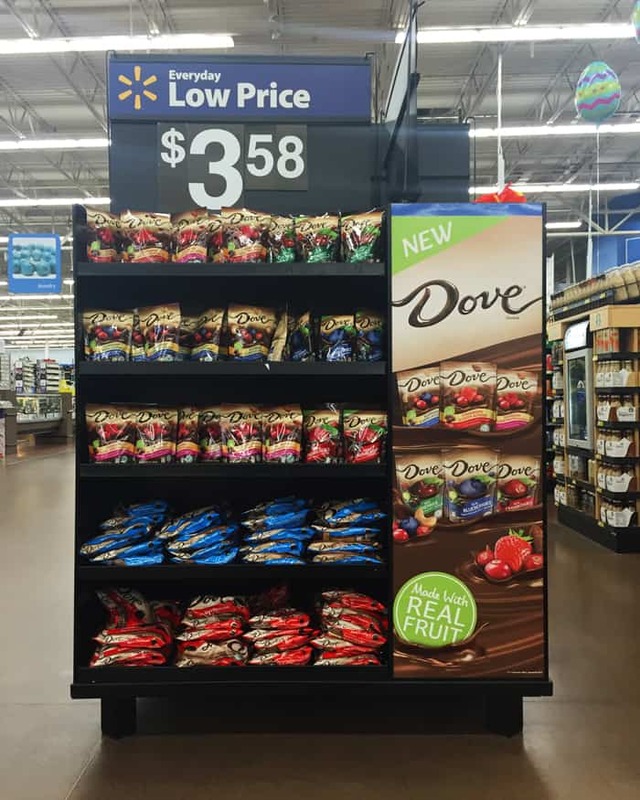 Look for DOVE® Chocolate Fruit & Nut products this month at Walmart on a special in store display! 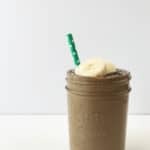 I have a bit of a thing for chocolate for breakfast but I’m like you – it’s gotta be healthy! 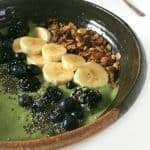 I need good-for-me foods to fuel my day and this looks like the perfect way to get going 🙂 I love that these are make-ahead so I don’t have to worry over one more thing in the mornings. Definitely need to give these a try!